Those green tomatoes are gorgeous – really full of flavour! It does look good. I think all our tomatoes are going to ripen this year, but we have made green tomato jam in previous years – that’s especially good with goats’ cheese. Better a red tomato than a green one! I was pleasantly surprised as I had never made this before. And yes, it´s great with goats´ cheese. The same happened with our cucumbers this year – we used seeds that someone gave us and they were ok, but really only ok. Girlfriend, you read my mind! I’m not bringing in green ones yet, but I had been searching for a recipe like this for next month! A thousand thanks! I see you couldn’t re-size the Leibster for the sidebar either – if anyone can tell me how to make it fit, I’d love to know! It´s such a straightforward and easy recipe, can recommend it. And I have trouble with that Liebster logo then gave up with it! Brilliant and Keith Floyd is a legend – he created the modern, wandering, TV chef format and we probably wouldn’t have food blogs without him! You´re right about Mr Floyd. He really inspired me in the 80s when I left home and was starting to cook and give dinner parties. I think the book I took this recipe from was one that I bought all that time ago! Yumm! Thanks for another great recipe Chica. This chutney looks fantastic! I was surprised at how good it was – not having made this before! I could see having a jar of that chutney on hand for soo many dishes and sides! The sweet and spicy combo sounds absolutely wonderful and I agree that the simpler the ingredients the better! Thanks so much – some of the recipes had lists of spices which were ridiculously long. This seems to work just as well. I just commented on another blog that my canning operation is closed for the year. You cannot and will not tempt me to can anything else until 2012, no matter how good the recipe sounds — and this one sounds really, really good. 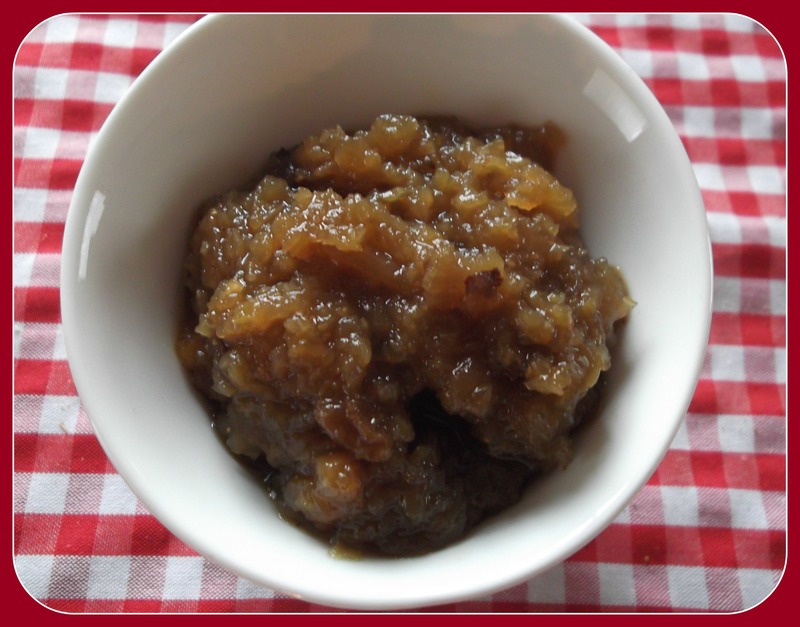 Aah – but I haven´t shown you my Christmas mincemeat yet! Well done you anyway for all that you have done this year. Get back to the delicious Italian recipes now! What a great idea for green tomatoes. We still have some out in the garden. I may just have to make this! Thanks for the recipe! It probably won´t use them all up (well, I don´t know how many you have) but if you do this and some fried green tomatoes, that should take care of them! Yum! This looks great! Thanks for linking up! Thanks for joining the linkup! I have some green tomatoes that I’m afraid are never going to have time to turn red–this would be a perfect use for them! Do you know about how long this chutney would last if I refrigerated it rather than can it? You´re welcome! I´m not sure how long it would last but going by a similar pickle that I “forgot” in the fridge after I had opened it…months, I should say! Looks great and everyone has a different season. We seem early on everything. So many tomato posts out there and ours are long gone. The few kilos I made, made quite a few jars – you could end up eating it all year! That looks so good! I can’t wait to get my kitchen set up in Madrid to start creating some recipes I’ve seen here. I’m getting tired of the suegra’s house and no cooking privileges!!! Oh you poor thing. I´d struggle to share a kitchen with my own mother let alone an “in law”. How lovely to be in Madrid – such a beautiful city. This sounds like something I should try. I just need to finish off my fig chutney, I need the jar!! Congrats on your almond crop too, I love their little furry jackets, so cute!! Not too late for me! Our tomatoes have taken forever to grow and ripen this year and we have plenty of green ones out on the vine. Thanks for the recipe! Green tomato chutney sounds wonderful!!! I can imagine how delicious must be with the tangy taste of green tomatoes.This is a very clever recipe! It´s a funny concept but a great way of using up some of those tomatoes that just won´t ripen! I need to grow some tomatoes…..this sounds amazing! It is rather good – but I still prefer the red ones! Oh how I wish I had my own garden!I am missing out big time! !